SITE DISCLAIMER: This site is designed to provide accurate information regarding the subject matter covered. It is not intended as a substitute for medical advice from a qualified physician. The reader should consult his or her medical doctor, or competent professional, before adopting the suggestions in this site, or drawing health inferences from them. Many people have diabetes, or undiagnosed medical problems, and are unaware of them. It is always recommended to get a physical before you are planning any major dietary changes. The author disclaims all responsibility for any liability, loss, or risk, personal or otherwise, from the use and application of any of the contents of this site. It is meant to be an educational site only! ADVERTISING POLICY: To help pay for the costs of the Healthy-Diet-Habits.com website, I am accepting advertising on my site, in the form of Google Ads, Affiliate Advertising, and direct advertising. Paid advertisers do not influence the content of the Healthy-Diet-Habits.com site. I recognize that your privacy is important to you! This document outlines the types of personal information I receive and collect when you use the Healthy-Diet-Habits.com website, as well as some of the steps I take to safeguard information. I hope this will help you make an informed decision about sharing personal information with me. 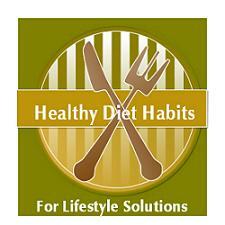 Healthy-Diet-Habits.com strives to maintain the highest standards of decency, fairness and integrity in all my operations. Likewise, I am dedicated to protecting my clients, and online visitors' privacy on my website. In some cases, I may collect information about you that is not personally identifiable. I use this information, which does not identify individual users, to analyze trends, to administer the site, to track users' movements around the site, and to gather demographic information about my user base as a whole. The information collected is used solely for internal review and not shared with other organizations for commercial purposes. If Healthy-Diet-Habits.com is sold, the information I have obtained from you through your voluntary participation in my site may transfer to the new owner as a part of the sale in order that the service being provided to you may continue. In that event, you will receive notice through my website of that change in control and practices, and I will make reasonable efforts to ensure that the purchaser honors any opt-out requests you might make of me. The Healthy-Diet-Habits.com website is protected by copyright. Do not copy without written consent.